Observation - Unknown Bird - UK and Ireland. Description: Hi. Sorry for bad quality photo - this bird arrived in my garden during the January cold snap and didn't look like any of my usual residents or visitors - can anyone help identify? Thanks! Hi. 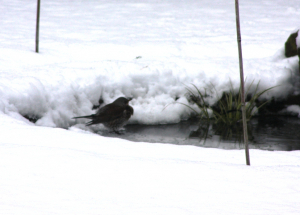 Sorry for bad quality photo - this bird arrived in my garden during the January cold snap and didn't look like any of my usual residents or visitors - can anyone help identify? Thanks!